I think I shared some succulent and drool worthy summer salads with you this week (*cough* excuse me while I toot my own horn). Some making for the perfect side dish while others making a great main dish. But in case you are still looking for tips and inspiration to make your own satisfying summer salad, check out the article below that I wrote for meal planning site Food on the Table. And be sure and check out the ten salad recipes at the bottom of this article! Warm weather often means lighter, fresher eating. Salads are perfectly light, yet satisfying, and are a great way to incorporate all the beautiful fresh, seasonal summer fruits and vegetables taking over the grocery store produce department. Below are few simple salad suggestions, to make that humble bowl of lettuce a refreshing summer meal. The Greens: Start your salad with a strong foundation of hearty greens. Iceberg, romaine, or green leaf lettuce are all a great start. But to add extra flavor, texture and nutrients mix in some spinach, arugula, bibb lettuce, radicchio, escarole or endive. To prepare salad greens, wash them under cool running water and dry on paper towels or using a salad spinner. After drying, chop or tear lettuce into bite size pieces. Pile on the produce: Don’t be afraid to load your salad with the freshest summer produce. Fruits and vegetables are low in fat and calories and will add exceptional flavor. Topping a salad with raw produce is common, but grilled or roasted fruits and veggies add extra flavor and texture. Add protein: Take a light salad to a satisfying and filling meal by adding some protein. Grilled steak, chicken, shrimp and fish are all obvious salad proteins. Other flavorful protein options include, ham, bacon, sausage, canned tuna, deli meats, or hard boiled eggs. To keep your salad vegetarian/vegan, add protein with cubed tofu, quinoa, chick peas, black beans, edamame or other legumes. Top it off: A well-built salad combines slightly soft yet crunchy ingredients to make texturally pleasing fare. Croutons, French-fried onions, nuts, seeds, dried fruit, sun-dried tomatoes, capers, olives, crushed chips, rice, couscous, pasta, or cheese, can make a classic salad an over the top sensation. Dress it lightly: While vinaigrettes and salad dressings can add and enhance the flavors of a salad, a little goes a long way. Over pouring the dressing can take an otherwise nutritious salad to an unhealthy mess. Also keep in mind, that vinaigrettes should be added right before serving as the oil will cause the lettuce to become limp. Take these succulent salad tips, and keep your summer salads a simple concoction or dress them up and make them your own! 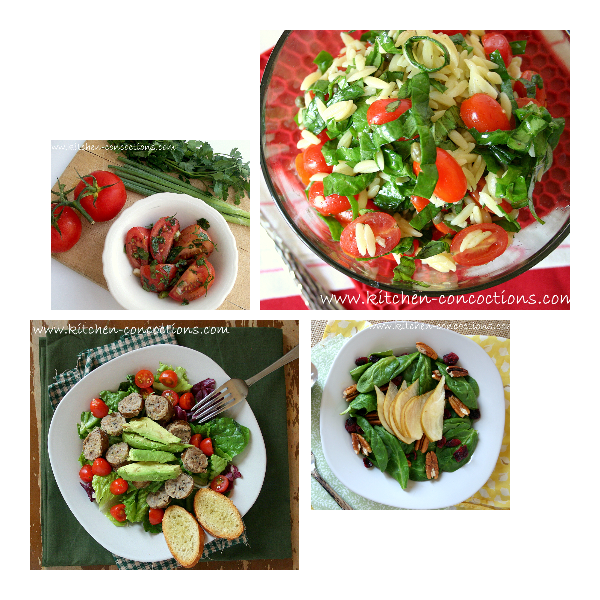 Below are ten amazing salad recipes from around the web to try this summer!